Houghton Mifflin Harcourt, 9781118472163, 152pp. Despite perennial interest in French macarons, as well as other unique dessert subjects like cake pops and whoopie pies, this is the first book that celebrates traditional macaroons. But these are nothing like the old-fashioned macaroons you may remember. Famous for his flavors of Danny Macaroons like salted caramel, Baileys, and red velvet, Dan Cohen offers macaroons for a new generation with nostalgic appeal for people who grew up on them. This unique cookbook is sure to delight anyone who loves to bake, but one special thing about macaroons is that they’re naturally gluten-free, made mostly with shredded coconut, sweetened condensed milk, and egg whites, plus whatever flavors you can imagine. This is great news to people who can no longer eat many desserts like cookies, cakes, and pies. Almost all of the fifty recipes are shown in beautiful photographs, and though making macaroons can hardly be any easier, there are step-by-step technique photos for first-timers. 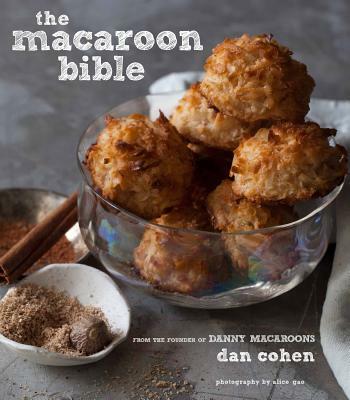 DAN COHEN founded New York City's premier macaroon company, Danny Macaroons, in 2010. These delicious coconut treats have been featured in Food & Wine magazine, the New York Post, Huffington Post, and Daily Candy. "... Cohen's easy-to-follow instruction make the treats easy to master. With so many varieties, even the most dedicated coconut-haters will enjoy getting to know this otherwise underappreciated delectable."